Editor's Note: This interview was originally published under the title "Diversity Heroes Update: eBook Dynasty" by the Victorian Multicultural Commission on June 16, 2016. 1. What has happened at eBook Dynasty since you received the Award for Excellence? 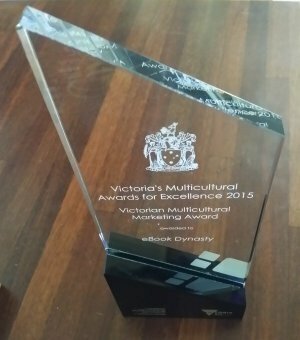 Since eBook Dynasty received Victoria's Multicultural Award for Excellence â€“ Victorian Multicultural Marketing Award in December 2015, we have been working doubly hard to promote our digital and print book publishing services as an Australian owned and operated business. We are still a newcomer in the global market, so it is with good will and hard work that we continue to build up friendship and trust with international and local authors, literary agents and publishers. To help with our work here in Australia, we have participated in various events and campaigns to promote Australian literature. For example, in January, we signed up for the Australian Women Writers Challenge to review at least 10 books by female Australian authors in 2016. As of the writing of this response to your question, we have reviewed six authors. This voluntary work is conducted conjointly with our effort to promote independent authors overseas, which we have so far reviewed five. We have also established collaborative relationship with Balestier Press in the United Kingdom to review two of their books. In March 2016, we received a grant from the Carl Brandon Society's â€œCon or Bustâ€� program to attend, cover and review â€œContact 2016â€�, the 55th Australian National Speculative Fiction Convention, in Brisbane. It was an inspiring and rewarding experience as we learned from publishers, literary agents and authors from across Australia, as well as colleagues from the Queensland Writers Centre, who shared their experiences within and outside the publishing industry. In April 2016, our manager served as an independent assessor for one of the Victorian Government's funding programs. I am sorry we cannot reveal more details, as everything should remain confidential until the funding results are announced later this year. 2. Has receiving the Award had an impact on you professionally or personally over the past five months? Receiving Victoria's Multicultural Award for Excellence â€“ Victorian Multicultural Marketing Award has had a huge impact on us, both professionally and personally. Here at eBook Dynasty, we feel honoured and humbled by such recognition of our hard work throughout the past three and a half years. More importantly, we feel inspired and encouraged, to do more and do better, to give back to this multicultural society in Victoria, Australia, that has provided such a vibrant and dynamic environment in which to work and live. 3. At the time of winning the Award, you said eBook Dynasty had been working hard to build a bridge between the English and Chinese literary worlds and also to encourage new and emerging Chinese-language authors to be published. Has this happened? Yes, it has advanced significantly. I am pleased to report that earlier this year, eBook Dynasty established collaborative relationships with Taiwan's HyWeb Technology Co., Ltd and China's Douban Read to promote Australian and other English authors to the Chinese World. As stated in our media release, HyWeb is an award-winning Taiwanese distributor of digital content to more than 700 libraries across the Chinese World, while Douban Read is a popular social network platform with about 60 million registered users and 80 million active users per month as of the end of 2014. In 2016, eBook Dynasty, HyWeb and Douban Read will promote 40 titles written by 34 authors from Australia, New Zealand, United States, Canada, United Kingdom, Italy and Kazakhstan. Among the first six authors featured by HyWeb's HyRead platform in May, four are from Australia. Meanwhile, we continue to work with authors, literary agents and publishers in Australia and overseas to translate, publish and promote their books to the Chinese World. For example, since December 2015 we have published eight digital and print books by authors from Australia, Taiwan, Hong Kong, Canada and the United States. We have also signed up new authors and publishers from New Zealand, Taiwan, China, Canada, Finland, Saudi Arabia, the United Kingdom and the United States. 4. Have you published any high-profile or notable authors/books since winning the Award that you can share with us? Here at eBook Dynasty, we believe that every author, literary agent and publisher is unique and notable, in the same way that every ordinary person is extraordinary for their own reasons. For the purpose of this interview, however, we would like to highlight two author who have recently published their books with us. Here in Australia, Brian P. Howley's children's book Col's Big Australian Adventure is illustrated by Taiwanese artist Shirley Chiang, who is in turn represented by Queensland-based The Illustrators Agency. A passionate teacher and talented poet, Howley says he â€œloves the power of words and how they inform, enlighten, heal, educate, entertain and inspireâ€�. His book is a tribute to this big beautiful country, and it remains his hope â€“ and ours â€“ that Chinese readers will want to learn more about Australia and maybe even want to visit one day and see some of the sights mentioned in his book. 5. Have you expanded the services you offer in any way since receiving the Award? Yes. Apart from our existing plans to help emerging and established Chinese and English authors to promote their writings as digital and print books in the Chinese World, and apart from the aforementioned promotional projects we have established with colleagues in Taiwan and China, we recently engaged with an author in the United States who intends to have her Chinese book translated into English. The book is a collection of life stories of Chinese migrants, most of whom have experienced turmoil of war and much hardship in their journeys across China and the Pacific Ocean to eventually work and settle in America. We consider this project to be in line with our effort to promote multiculturalism and the benefits of cultural diversity. 6. The last time you spoke with us, you planned to create an additional website for associate translators. Has this happened? It is happening. We have established the structure of the website and the database behind it is advanced. We are also in the process of researching, collecting, verifying and creating the textual and multimedia content for the site. More importantly, we have been gathering associate translators and brainstorming for their aspirations and ideas as freelancing and full-time professionals. We very much want to focus on quality of translation and a Code of Ethics that is similar to the one designated by the Australian Institute of Interpreters and Translators (AUSIT). 7. You planned to set up a readers' forum online â€“ has this happened and if so, how is it going? This is also happening, but its implementation and public release will follow that of the aforementioned website for translators. Apart from the technological aspects, we are working to provide a series of book reviews that may serve as inspirations to readers who are interested in giving feedback. These will make their way into the forums in some format. 8. In 2016, you were planning to launch your own ebook format for both the traditional and simplified Chinese character sets. Has this happened? It is not ready yet, but is on the way. To refrain from bogging this interview with complex technical details, let us simply say that a good technology requires excellent interface design, cutting-edge algorithms, and a well planned and executed marketing campaign. As mentioned in Toy Story 2: â€œYou can't rush art.â€� And good software is ART. 9. Is there anything else you would like to tell us about eBook Dynasty, you personally or about winning an Award for Excellence? For more details about Victoria's Multicultural Award for Excellence and the Victorian Multicultural Marketing Award, please see HERE.